Though the plasma FDPs have been found to be associated with OSMF, very few studies in the literature were able to demark their role in the etiopathogenesis of OSMF. The purpose of the systematic review was to determine whether there is any association between these FDPs and OSMF or not. Articles were searched and selected for the related topic using Google, PubMed; MEDLINE from 1979 till date. Article search included only those articles published in the English literature. Article search through PubMed and internet sources was done using the following key words: Oral submucous fibrosis, plasma fibrinogen, plasma fibrinogen degradation products, fibrin precipitating factor, areca nut, and carcinoma. Journals evaluating the role of these plasma FDPs in the etiopathogenesis of OSMF were referred for review. Published reviews were selected if they met the following criterion: Cross-sectional studies elucidating the role of plasma FDPs in the etiopathogenesis of OSMF and the mechanism by which they exert their role. Studies that evaluated the role of plasma FDPs in the etiopathogenesis of OSMF. Studies with missing data that could not be supplied by the study authors. A total of nine studies by different authors were selected in this review. The studies were included based on data extraction and analysis of the quality of studies and by exploring publication bias. The primary outcome was to elucidate the role of plasma FDPs in the etiopathogenesis of OSMF and the mechanism by which they exert their role. Potentially relevant articles for systematic review were obtained; data extracted from each article were tabulated and cross checked. The selected articles were divided into subgroups of author name and year of publication, subject groups, and results, as shown in [Table 1]. All the included studies evaluated the presence of plasma FDPs in OSMF patients. Six of the authors found strong positive association of the FDPs in all the subjects of OSMF included in their studies. One author observed that plasma FDPs could be detected in only more than half of the total cases of OSMF. One of the studies indicated that there was no strong association between the FDPs and OSMF. Various studies have been reported in the literature evaluating the association between FDPs and OSMF. Variable results have been reported in all the studies. The reason could be the different methods used to evaluate these products. In 1979, Pathak  reported the case of a 25-year-old male patient with stage III OSMF and the habit of chewing areca nut, and observed that when the saliva of the patient suffering from OSMF was mixed with the plasma of the same patient and of two other normal control persons and incubated at 37°C, a strong fibrin producing factor (FPF) was detected in the saliva of the OSMF patient. An elevated plasma fibrinogen level was found in the OSMF patient. Precipitable fibrinogen at 37°C and cryoprecipitate containing fibrinogen and IgG were also detected in these patients. He also observed that elevated fibrinogen level and precipitable fibrinogen were found in other cases of OSMF patients too at 37°C and 4°C. In 1984, Pathak  detected circulating molecules that were immunologically similar to fibrinogen in seven patients suffering from OSMF, as suggested by the hemagglutination inhibition studies using the FDP kit and by paracoagulation tests such as serial dilution protamine tests. According to him, fibrinogen, fibrinogen intermediates, and FDPs deserved further scrutiny, as this might help define the etiology of OSMF which had been obscure at that time. In 1984, Pathak  reported the case of a 25-year-old male suffering from OSMF without any habit of chewing tobacco and areca nut. He was well-built and nourished, except that he was suffering from iron deficiency anemia. Fibrinogen and its degradation products were assayed in a hemagglutination inhibition system using the FDP kit (Wellcome). Plasma fibrinogen level was found to be increased to 800 mg/ml (normal 200-400 mg/ml). FDPs were also found to be elevated. Cryofibrinogen was detected in heat-oxygenated plasma and also in dilute oxylated plasma. No precipitate was detected in the control tubes kept at 37°C. FPF, a factor that had been described previously in routine saliva, was also detected in the saliva collected after parotid duct stimulation. In 1990, Ghosh et al. also observed significant increase in the mean values of plasma FDP levels with the advancement of stages in oral cancer patients as compared to normal individuals. In 1992, Phatak  reported in his review that OSMF is a chronic disseminated intravascular coagulation syndrome, in addition to being a local coagulopathy. He also mentioned about the thrombin-like substance termed as FPF in the saliva of patients with OSMF as compared to normal saliva. In the normal saliva, fibrinolytic substances are present. 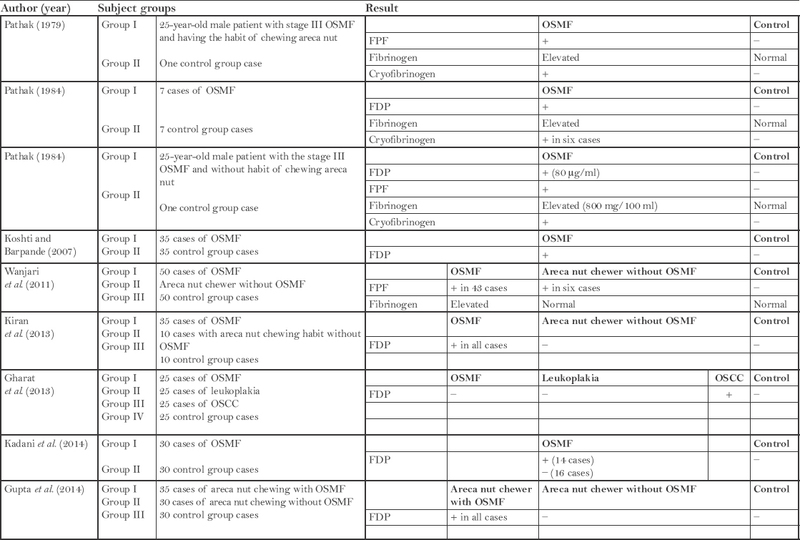 In 2007, Koshti and Barpande  performed a study on 35 patients of OSMF and found a significant increase of plasma FDP levels with an increase in the clinical grades of OSMF. Comparison with histological grades of OSMF showed an increase in plasma FDP levels with an increase in the histological grade of OSMF, but the increase was not statistically significant. They found that plasma FDP was an early indicator of fibrin deposition. When the plasma FDPs increased, the fibrin deposited also increased. The quantification was based on latex agglutination method used by XL-FDP kit. In 2011, Wanjari et al. also estimated the presence of FPF in the saliva of OSMF patients. Plasma fibrinogen level increased in the subjects with positive FPF as compared to subjects with negative FPF. Patients with increased plasma fibrinogen level and positive FPF are at greater risk of OSMF as compared to patients with normal fibrinogen level and negative FPF. Their results provide evidence that there is a definite relation between FPF and increased fibrinogen level in OSMF. In 2013, Kiran et al. conducted a study consisting of 35 cases of areca nut chewers with OSMF, 10 patients with areca nut chewing habit but with apparently normal oral mucosa, and 10 normal patients without any habit (control group). The patients were evaluated for plasma FDP levels. It was observed that all the areca nut chewers with OSMF showed the presence of plasma FDP. However, controls and subjects with the habit but without OSMF did not show FDP in the plasma. It was also noticed that there was not any statistically significant association between the levels of FDPs in various clinical and histological grades of OSMF. In 2013, Gharat et al. conducted a study comprising 25 cases each of leukoplakia, OSMF, and Oral squamous cell carcinoma, and normal control cases. No significant association was found between the FDPs and premalignant lesions including OSMF. However, increased serum FDP levels were seen corresponding to the stage of the OSCC, but no appreciable difference was noted between the histological grades. Kadani et al., in their study on FDPs in 2014, comprising a total of 30 subjects with OSMF and 30 control group subjects observed that out of total 30 cases of OSMF, 14 subjects showed FDP levels above 200 ng/mg and 16 subjects showed negative response to the presence of FDP level. The probable reasons for undetectable FDP levels in some cases could be because of the method employed by the kit to detect FDP levels. Latex agglutination slide test method was used in their study, which according to previous studies lacked sensitivity to detect minimal rise of FDP levels, resulting in lower sensitivity. Qualitative method of estimation for FDP levels did not show an association between the FDP levels and OSMF. Semi-quantitative method of plasma FDP estimation did not show an association between increased level of FDP and the increase in severity of OSMF. In 2014, Gupta et al. conducted a study including 35 subjects with OSMF and having the habit of areca nut chewing, 30 subjects having areca nut chewing habit without OSMF, and 30 control group subjects. They observed in their study that plasma FDPs were detected in all the areca nut chewing subjects with OSMF, but could not be detected in the other two groups. Also, it was observed that as the clinical grades of OSMF increased, the levels of plasma FDPs also increased. The quantification was based on the principle of agglutination. The method used by XL-FDP reagent kit could detect FDPs above the level of 200 ng/ml. Several etiological agents have been found to be responsible for the progression of OSMF. However, areca nut is supposed to be the major causative agent. Various chemicals released by areca nut chewing act as a source of continuous irritation to the oral mucosa. Over a period of time, due to persistent habit, chronic inflammation sets in at the site. Fibrinogen is an acute phase reactant which increases throughout the inflammatory process. In response to inflammation, the body produces more fibrinogen and its degradation products. Fibrinogen metabolism is related to increased fibrinogen levels, fibrinogen cyroprecipitability, FDPs, and FPF. Based on these four factors, a possible hypothesis regarding the mechanism of OSMF has been described. It states that the parotid saliva contains a coagulant or procoagulant which is designated as FPF. When this FPF interacts with the fibrinous exudates in the oral cavity, it promptly clots the fibrinous exudates. This reaction is accelerated by calcium ion, though it is not entirely calcium dependent. After the formation of clot, the ensuing thrombin perpetuates the process. The fibrinopeptides try to combat inflammation, while FDP counteracts the thrombin-like action of FPF and the thrombin produced in the autocatalytic process. As no hemorrhagic manifestations are encountered in OSMF, FDPs are labeled as molecules immunologically similar to fibrinogen (MISF). As the severity of the disease increases, more FPF is produced and, in turn, more FDP is produced. These plasma FDPs are an early indicator of fibrin deposition; increase in their level with increase in clinical grade suggests that there is increased fibrin deposition in OSMF, thus increasing the severity of the disease. Also, these FDPs have been detected in various malignant conditions and their level increases with the progression of the disease, which indicates that it can be an early valuable sign in the diagnostic and prognostic evaluation of carcinoma. As the clinical Grade IV of OSMF is also associated with other potentially malignant disorders or oral carcinoma,  the levels of plasma FDPs can be elevated with the increased severity of disease. The reference range of FDP levels is less than 10 mcg/ml (conventional units) or less than 10 mg/l (SI units). An FDP level of more than 40 mg/ml is considered critical. High levels of these products can cause glomerulosclerosis, cerebral contusion, pulmonary embolism, deep vein thrombosis, liver cirrhosis, disseminated intravascular coagulation, arterial thromboembolism, tachycardia/palpitation, tachypnea/dyspnea, hypotension, acute myocardial infarction, ventricular fibrillation, arteriosclerosis, and related effects. In 1982, Chan et al. reported in their study that the FDPs were increased in diabetic nephropathy leading to fibrin deposition in the endothelial and mesangial regions. Similarly, in 1993, Song et al. also found in their study that FDPs were elevated in various liver diseases, especially cirrhosis of liver, leading to fibrin deposition and thus fibrosis. A study conducted by Whitaker et al. in 1984  showed that the mean concentration of FDPs was raised in plasma of patients with pulmonary embolism, deep venous thrombosis, arterial thromboembolism, and disseminated intravascular coagulation, as compared to the normal subjects. Similarly, in 1986, Elms et al. also found in their study that plasma from normal subjects was negative for FDPs using latex agglutination, but positive results were obtained in patients of deep vein thrombosis, pulmonary embolism, or disseminated intravascular coagulation. Obviously, these plasma FDPs may also produce some systemic effects in the patients with OSMF. Therefore, their association with OSMF patients should be evaluated. They can be used as an early indicator of OSMF. Their detection in the plasma could be used as a diagnostic aid in suspected OSMF cases and it could help to stop the progression of further disease. Studies done by various authors in the literature show that FDPs may be associated in the etiopathogenesis of OSMF and further progression of this disease to increased clinical grades and the risk of carcinoma, but the exact role of these factors is still obscure. Studies with large sample size are still required to evaluate the definite association between these FDPs and OSMF. This is a noninvasive method to evaluate the stage of OSMF patients, instead of using invasive techniques like biopsy. Rajendran R. Oral submucous fibrosis. J Oral Maxillofac Pathol 2003;7:1-4. Koshti SS, Barpande S. Quantification of plasma fibrinogen degradation products in oral submucous fibrosis: A clinicopathological study. J Oral Maxillofac Pathol 2007;11:48-50. Shah N, Sharma PP. Role of chewing and smoking habits in the etiology of oral submucous fibrosis (OSF): A case-control study. J Oral Pathol Med 1998;27:475-9. Kuo MY, Chen HM, Hahn LJ, Hsieh CC, Chiang CP. Collagen biosynthesis in human oral submucous fibrosis fibroblast cultures. J Dent Res 1995;74:1783-8. 5. Trivedy C, Meghji S, Warnakulasuriya KA, Johnson NW, Harris M. Copper stimulates human oral fibroblasts in vitro: A role in the pathogenesis of oral sub mucous fibrosis. J Oral Pathol Med 2001;30:465-70. Seedat HA, Van Wyk CW. The oral features of betel nut chewers without submucous fibrosis. J Biol Buccale 1988;16:123-8. Seedat HA, van Wyk CW. Submucous fibrosis in non-betel nut chewing subjects. J Biol Buccale 1988;16:3-6. Song KS, Kim HS, Park KE, Kwon OH. The fibrinogen degradation products (FgDP) levels in liver disease. Yonsei Med J 1993;34:234-8. Pathak AG. Fibrin producing factor in oral sub-mucous fibrosis. Indian J Otolaryngol 1979;31:103-4. Pathak AG. Hypercoagulation and fibrinolysis in oral sub-mucous fibrosis. Am J Clin Pathol 1984;81:623-8. Pathak AG. Molecules immunologically similar to fibrinogen (MISFI) in oral submucous fibrosis (OSMF). Indian J Otolaryngol 1984;36:45-7. Ghosh M, Aroor R, Raghavan MR. Clinical utility of serum fibrinogen degradation products (FDP) in the diagnostic and prognostic evaluation of oral cancer. Ann Dent 1990;49:11-2, 45. Phatak AG. Oral submucous fibrosis-a chronic disseminated intravascular coagulation syndrome with local coagulopathy. Gut 1992;34:713. Wanjari PV, Wanjari SP, Gharote HP, Warhekar AM. Correlation of presence of salivary fibrin producing factor with plasma fibrinogen levels in oral submucous fibrosis, arecanut chewers and normal subjects. J Indian Acad Oral Med Radiol 2011;23:559-62. Kiran G, Muni Sekhar M, Hunasgi S, Ahmed SA, Suri C, Krishna A. Plasma fibrinogen degradation products in betel nut chewers - with and without oral submucous fibrosis. J Oral Maxillofac Pathol 2013;17:324-8. Gharat L, Rathod GP, Kandalgaonkar S. Quantitative estimation of serum fibrinogen degradation product levels in oral premalignant and malignant lesions. J Int Oral Health 2013;5:65-72. Kadani M, Satish BNVS , Maharudrappa B, Prashant KM, Hugar D, Allad U, et al. Evaluation of plasma fibrinogen degradation products and total serum protein concentration in oral submucous fibrosis. J Clin Diagn Res 2014;8:ZC54-7. Gupta S, Manjunath SM, Jawanda MK, Bharti A. Quantification of plasma fibrinogen degradation products in areca nut chewers with and without oral submucous fibrosis. J Clin Diagn Res 2014;8:ZC27-30. Ranganathan K, Mishra G. An overview of classification schemes for oral submucous fibrosis. J Oral Maxillofac Pathol 2006;10:55-8. Duh SH, Cook JD. Laboratory Reference Range Values. Stedman's Online. Available from: http://www.stedmansonline.com/webFiles/Dict-Stedmans28/APP17.pdf. [Last accessed on 2012 Sep 7]. Daniels R. Delmar's Manual of Laboratory and Diagnostic Tests. Independence, KY: Delmar Learning; 2009. Chan V, Yeung CK, Chan TK. Antithrombin III and fibrinogen degradation product (fragment E) in diabetic neuropathy J Clin Pathol 1982;35:661-6. Whitaker AN, Elms MJ, Masci PP, Bundesen PG, Rylatt DB, Webber AJ, et al. Measurement of cross linked fibrin derivatives in plasma: An immunoassay using monoclonal antibodies. J Clin Pathol 1984;37:882-7. Elms MJ, Bunce IH, Bundesen PG, Rylatt DB, Webber AJ, Masci PP, et al. Rapid detection of cross-linked fibrin degradation products in plasma using monoclonal antibody-coated latex particles. Am J Clin Pathol 1986;85:360-4.